I generally don't respond to book reviews or articles about my work. I especially don't respond to those reviews that seem the most critical because, in my experience, they're also usually not worth responding to (and often amount to some form of "I hold X; Smith holds Y; ergo, Smith is wrong" Uh, nope!). In the same vein, while any author soaks up glowing reviews, I don't often learn much from them. So I'm appreciative, but they don't really advance the conversation. A real gift to an author is a review that is constructively critical, that appreciates the argument and then pushes back on those points that deserve push back. I learn from such reviews, and engaging them becomes a way to advance my own project. It was in that spirit that I briefly engaged the review of Teaching and Christian Practices written by Jesse Covington, Maurice Lee, Sarah Skripsky, and Lesa Stern--who I now think of as "the Westmont Four" (W4 for short). Since then I had the pleasure of spending a week at Westmont College last spring, leading an interdisciplinary seminar on Christian formation and higher education. They were wonderful hosts, and I fear I learned more than I taught. 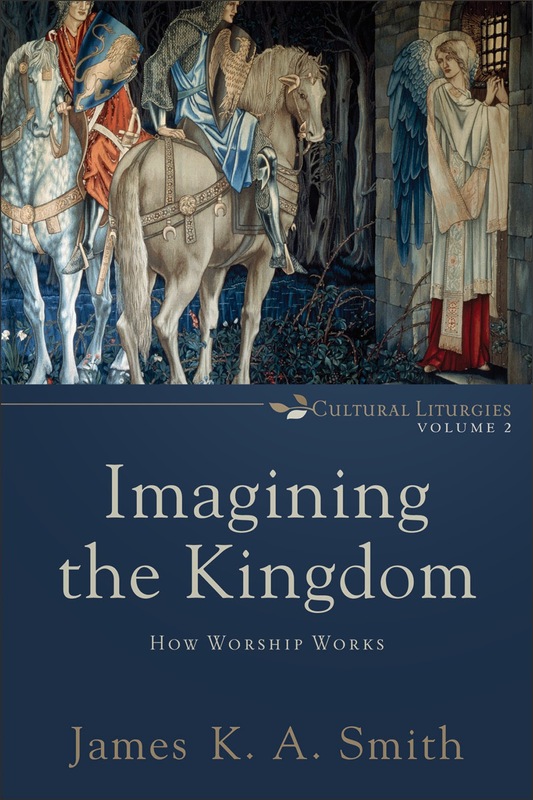 So I was excited to see the Westmont Four's their review of Imagining the Kingdom, "Irreducibly Embodied," in the most recent issue of Books and Culture. Once again, they have posed some important questions (I won't be able to answer them all), and in the spirit of advancing the conversation, I thought I might take just a few moments to reply. W4 claim that I claim "to be opposed to a hierarchical dualism of mind and body that prioritizes intellectual, reflective, discursive cognition over practical, affective, aesthetic involvement." This is why they are puzzled "to see repeatedly this very dualism, inverted but reinstated." I, too, was surprised to see this framed in terms of a critique of dualism, since I didn't recall framing my criticism in those terms. Re-reading ITK, I note that the word "dualism" only occurs twice, both times in reference to others, and never in the way the reviewers suggest here. Whence this impression, then? First, I think W4 might be confusing a duality with a dualism. Not all distinctions are dualistic. I take dualism to be, roughly, a hierarchical distinction that devalues one of the terms of the distinction. So, for example, a gnostic soul/body dualism not only distinguishes soul and body but also denigrates the latter. In contrast, Thomas Aquinas' hylomorphism also distinguishes soul and body but then affirms that the person is the holistic composite of the two, and that each has their own "operations," as he might put it. I don't anywhere try to deny the duality between something like "mind" and "body." What I argue is that too many pedagogies have effectively and functionally ignored the role of the body and its unique "operations" in shaping our being-in-the-world. Merleau-Ponty is attentive to what we might call our “hybridity,” our sort of incarnational suspension between angelhood and animality—as mind and body. He is trying to describe our comportment to the world as neither intellectualist nor merely a reflexive biological response to stimuli. Our being-in-the-world is between instinct and intellect. Such an account of embodied perception pushes back against Cartesian “thinking-thing”-ism that would reduce us to minds merely carried in the vehicles of our bodies as well as a reductionistic animalism that would reduce all of our action and perception to mere biological response to stimuli. I don’t just abstractly think my way through the world, but neither am I merely a passive victim of impressions, bounced around by instinctual reflexes.23 I’m not an angel, but neither am I an insect (PP 90); I am not merely a mind trucking around in a body, but neither am I just a bundle of biological mechanisms passively responding to my environment. So what we need, Merleau-Ponty argues, is a model of the human person that does not fall prey to the dichotomies of mind or body but rather does justice to our “betweenness”24 and its peculiar preconscious knowledge (ITK, pp. 43-44). This is not a rejection of intellection or “objective thought” per se; neither does Merleau-Ponty mean to consign us to mere biological responses to stimuli. Indeed, his appreciation of the centrality of the body in the constitution of meaning is decidedly antireductionist, resisting both materialism and intellectualism (ITK, p. 70). It is just this bodily attunement and perception that underwrites “objective” knowledge and intellectual reflection. It is not either perception or knowledge. It’s not a question of choosing to settle for some crude, unthinking kinaesthetic perception of the world and thus forgoing intellectual reflection; rather, I perceive in order to understand. Merleau-Ponty has emphasized that perception is not just some kind of crude, ham-fisted theorizing of the world; rather, perception is a fundamentally different (and primary) way of intending the world, of meaning the world with the body. Perception does not just provide the raw materials to be processed by intellection. However, that doesn’t mean there is no relation between perception and objective knowledge. In fact, the latter is rooted in the former as its condition of possibility. Reflection is embedded in “primary perception” that is “non-thetic [i.e., non-positing], pre-objective and preconscious experience” (PP 281). Merleau-Ponty’s account does not denigrate reflection or devalue objective knowledge. He simply situates it and emphasizes its dependence on the primacy of perception. So it’s not a matter of valorizing perception over reflection but of reconceiving the nature and task of reflection. What Merleau-Ponty offers, then, is a new account of what we’re doing when we “know” the world objectively in a reflective mode (ITK, p. 72). Do I collapse the university into the church? W4 worry that I don't clearly delineate the Christian university as a site to love God with the mind. I confess I'm getting a little tired of this mis-reading, but I obviously have to take some of the blame for its endurance. Once again, it seems odd to think that a book that asks readers to wade through the thicket of the likes of Merleau-Ponty and Bourdieu somehow devalues "the mind." And since I hope that this is a book that will be read in Christian colleges and universities, can we safely conclude that I don't envision the university as Sunday school class? [W]ith its critique of rationalist or intellectualist models of the human person, it would seem that Desiring the Kingdom plays right into the hands of antiintellectualism. Indeed, some seem to worry that my model would simply have us spending all day in chapel or turning the Christian college into a glorified Sunday school. But such worries stem from a misunderstanding of my emphasis on worship with respect to worldview. In particular, such a worry seems to read my claim that worship is a necessary and important condition for integral Christian education as if I were claiming that it is a sufficient condition for Christian education (and this includes Christian education in the wider sense of discipleship, even though my focus tends to be on Christian higher education). But I’m not suggesting we raze the physics labs and expand the chapel. I’m not suggesting we demolish the literature classroom and just stay in church all week. Nor do I anywhere suggest that a Christian university is not about the business of ideas! Of course it is. The issue is whether it is just trafficking in ideas. It’s the latter that I’m rejecting. In this context, W4 also seem to think that the Christian university should have its own liturgies, and that "importing" liturgical practices from the church are inappropriate. Here I think we just bump up against very different ecclesial sensibilities. Westmont is a generically evangelical institution, and (from my experience) it seems that many students and faculty locate themselves in nondenominational "evangelical" contexts. My approach is more forthrightly Catholic and envisions a robust connection between the church and college (without collapsing the two). So admittedly, my vision of the "practiced" Christian university looks more like the University of Paris at its origin than a contemporary evangelical college. I could say more, but won't. This is already too long. In conclusion, let's just keep in mind my quarry here: I am not just trying to make sense of how Christian formation works. My project is to offer a Christian philosophical account of liturgical formation more broadly, including cultural (or "secular") liturgies, some of which will count as de-formations from a Christian perspective. My quarry is as much a phenomenology of temptation as it is a phenomenology of Christian worship (see ITK, pp. 140-142). In the end, I think this is a serious and charitable review still written from within an "intellectualist" paradigm. And from within that paradigm, any proposal that doesn't conform ends up looking anti-intellectual and irrational. But of course my project is to try to invite us outside that paradigm.